Have you ever asked God for wisdom, cracked your Bible open to a random spot, and the answer is in the first verse you read? But I have found answers to my prayers in the passages of Scripture I am currently reading. Take yesterday and today, for example. Right now I have two jobs that I thoroughly enjoy. They are challenging and often push me out of my areas of expertise and comfort enough to keep me very dependent on God. There are many creative opportunities every week – in both artistic (I love to paint and write and take pictures) and problem solving (How can we make this happen? Can we do this better?) situations. And in all this, I have the privilege of inspiring and leading others. I enjoy all these aspects so much that I work hard, fully engaged with everything in me, for long hours. Stay up late, get up early. The proverbial candle has been burning toward the center with increasing speed and intensity. During the past couple of weeks my Bible reading has been all over the place – a chapter here, a section there – without continuity. That’s not bad, in fact I enjoy the spontaneity and freedom. Then someone mentioned the tree planted by streams of water in Psalm 1 in a conversation. It’s one of my favorite Psalms, so I pulled out my Bible when I got home and let the familiar promises (and warnings) wash over my heart and flow into my mind. I was completely hooked. Again. 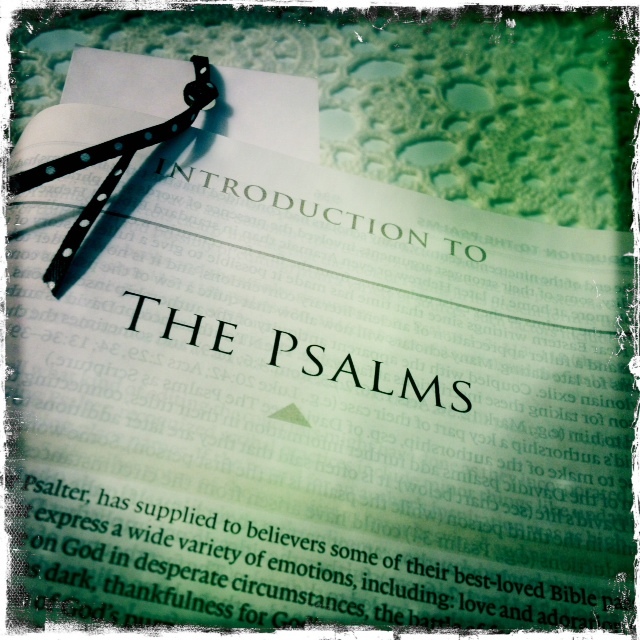 Reading, studying, and digging into the Book of Psalms is always a treat. That brings us to yesterday’s and today’s reading: Psalms 3 and 4. The context for this verse is that God gave David so much peace in the midst of his enemies, he was able to get the sleep he needed. While I am not being chased by my estranged son and his army, I am constantly pursued by excellence and giving my best to the point that I forget I have limits. I need rest. I need to take the time to prepare nutritious food. I need the endorphins and other health benefits of regular exercise. So, I made a mental commitment yesterday morning to bring my physical needs back into balance with ministry activities… and ate chocolate-covered pomegranates and nacho chips for dinner at 8:30pm while still at work, got home very late and finally fell into bed after midnight. Message received. Loud and clear. Twice. Jesus took time to care for his physical needs. It’s not un-spiritual or less important than my ministry to-do list. In fact, this is part of the foundation to being able to minister effectively. As I talk with others in ministry, this issue comes up a lot. Let’s encourage and help one another figure this out. Please share your ideas.